It's fourth down-Punt or go for it? Punt or go for it? Interesting insight from David Romer's research at the University of California. 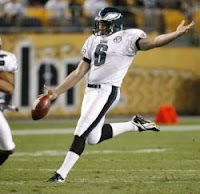 He studied decision making by professional football coaches related to "punting or going for it on fourth down." In short, he discovered that coaches would actually win more games if they went for touchdowns and first downs instead of punting or attempting field goals. Here is the problem: Every coach (and leader) knows that whenever he decides to run a play on fourth he not only sets himself up for potential success he also sets himself up for potential criticism. So ultimately the thought of Monday morning criticism sometimes clouds or even overrides the game day decision to go for it. If you are a leader you can probably literally feel the tension of this scenario. On one hand the potential for extreme success--on the other hand the potential for extreme criticism. So in your organization, or sphere of influence, do you punt more or go for it more?...and maybe an even more important question--why? In 1 Samuel 15:24 one phrase gives us insight into a major component of the demise of Saul's influence as king. It says, "I was afraid of the people so I gave into them." I recently heard Andy Stanley say that this very thing [fearing what people will do or think] has the potential to de-rail an organization especially when the organization is fragile. He went on to say when we give in, we aren't leading people we are simply taking a poll. Leadership Question: Will you allow the potential for success be outweighed by the likelihood of criticism? What do you fear losing? Plain and simple leadership is risky business, often lonely, and it frequently puts the bulls eye of criticism on your back. Certainly wisdom must guide us but I don't believe playing it safe is always our best course of action!! Are you leading or taking a poll? How should I respond to performance Evaluations? 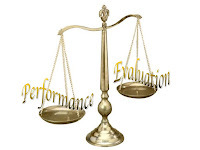 What is your initial response when you hear the words performance evaluation? Do you tense up? Pass out? Immediately begin your defensive action plan? Do you think pay cut? Pay raise? Do you consider quitting before it happens? Take a sick day? Do you get excited about feedback? 2) Spend time investing in people who are strong where you are weak-- Keith McFarland said it this way in his book "The Breakthrough Company" "People are our most valuable resources yet we often invest the least amount of resources in them." Believe it or not there are people who are not only good at the things you are weak in but they also love doing the things you are weak in. Find those people and give them your time and give them permission to leverage their strengths in your areas of weakness. 3) Spend time developing systems that compensate for your weaknesses-- Systems determine behavior and systems also help compensate for areas where we are naturally weak. For example: If organization is your weakness spending hours trying to become an organized person is an unwise investment of your time. Developing a system that externally implements organization is a great idea. A simple example of a system is using entourage or outlook reminders: Schedule automatic reminders about weekly things that you need to do...even simple stuff like "send an encouragement note to a team member or client"--that pops up on your screen every Tuesday at 10am! Just a few thoughts I've been reminding my incredible staff team at Ridge Church as we go through performance evaluations from the last year. I'm so blessed to have a talented and teachable team! Breaking the power that ____has over me! There are often things in our lives that just seem to have an unbreakable power over us. We try to stop, we try to change our pace, we try to change our tone, we try to look away...but we keep getting drawn in and losing the battle. BUT--there are some practical things we can do to begin to break the power that (stuff--whatever it is for you and me). 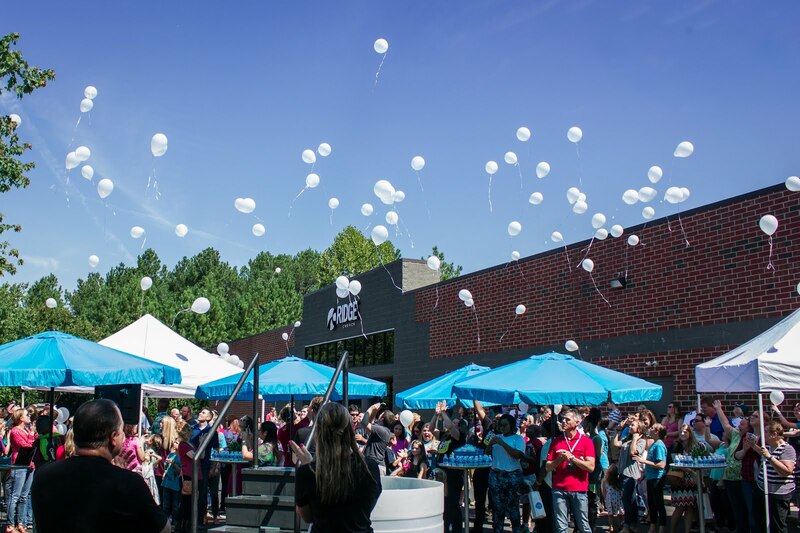 Go HERE to listen to the message called "No Survivors" and get the full context of the challenge. Take the challenge! 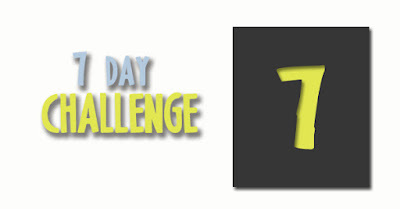 If you have already done this then extend the challenge for another 7 days or more? Some of you had every intention of taking the challenge but then Monday happened, life happened, family happened, your in box happened and you simply never got to it. It's not to late. 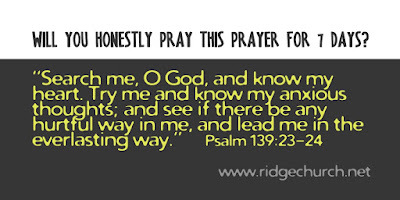 Here is the paraphrase of the Psalmist words above that I turned into a prayer in my journal. Maybe this should be your prayer too: "God is there anything I'm doing or becoming that will lead to hurt for me or those I love?" Whatever you face this week I would like to invite you to remember that God is for you--but "Because of who he is for, there are some things that he won't ignore." Your heavenly Father wants you to live in freedom! !